Mekong River The mystical Mekong runs from the mountains of Tibet to the delta in Vietnam. Passing through Cambodia, the Mekong is the site of a spectacular waterfall on the Laos border as well as submerged or flooded forests, scenic islands, rapids and freshwater dolphins (Irrawaddy Dolphins). Boat trips on the Mekong offer amazing sights and an extraordinary adventure. It is possible to kayak down the Mekong and through the flooded forests, cycle along scenic river routes and camp on remote islands. Check out Kayak Adventures and Bicycle Trips. Four Rivers Cambodia's greatest rivers, the Mekong and the Tonle Sap cross directly in front of Phnom Penh's Royal Palace (named the "Four Rivers Palace" for it's view), giving birth to the smaller Bassac River and creating a geographical X. 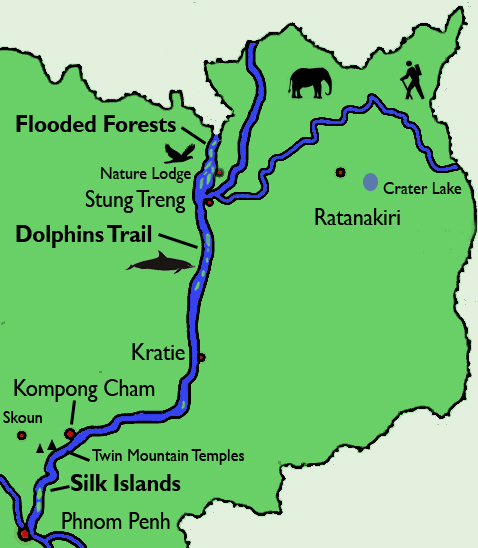 The meeting of these rivers also results in a meeting of silts, fish and ethnicities as Khmer, Vietnamese and Cham communities live and fish the area. 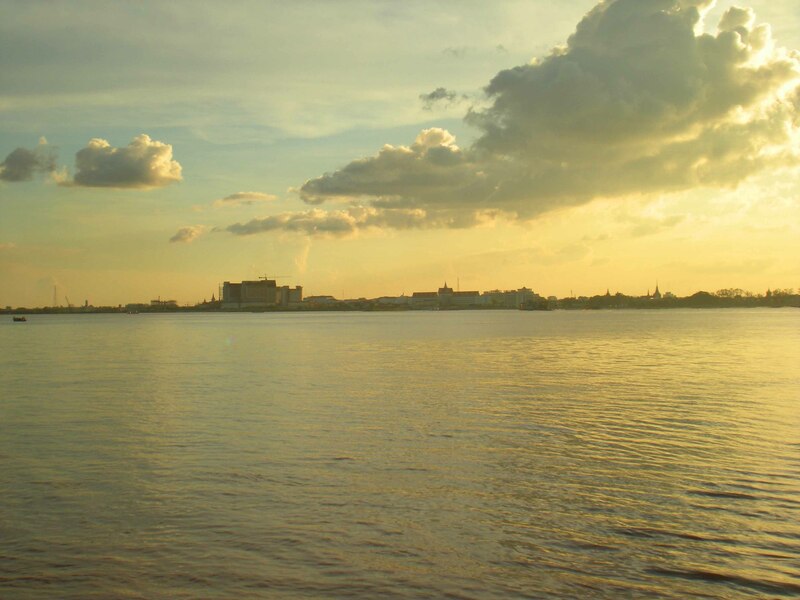 A sunset cruise through the 4 rivers offers incredible views of the city and the river geography. Mekong River Islands A number of rural islands can be found in the Mekong and can be very rewarding to explore. 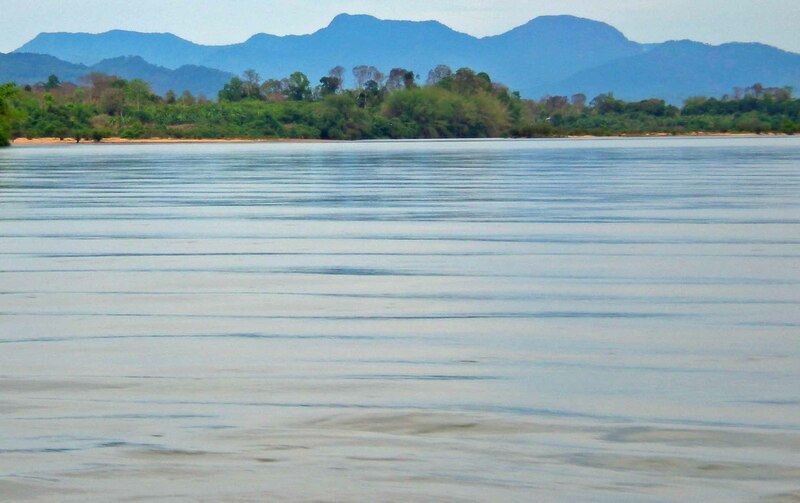 Scenic river islands can be visited in kayak and cycling trips down the Mekong or in day trips from Phnom Penh. The Silk Islands and Mekong Island north of Phnom Penh can be visited in a day trip boat cruise or cycling tour and have scenic river views, villages, pagodas and silk-weaving communities. 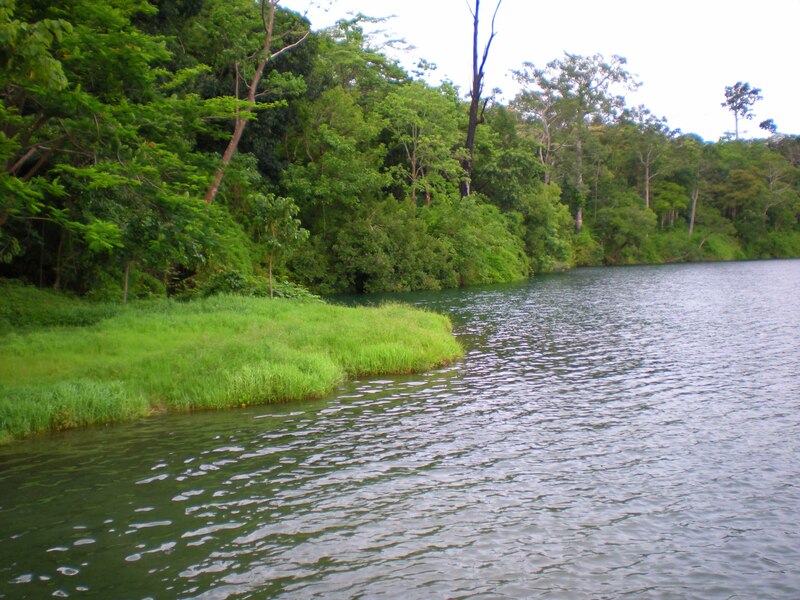 Yak Lom Crater Lake A round, crystal clear lake in a community of hill tribes surrounded by jungle, Yak Lom Lake is Ratanakiri's can't miss destination. 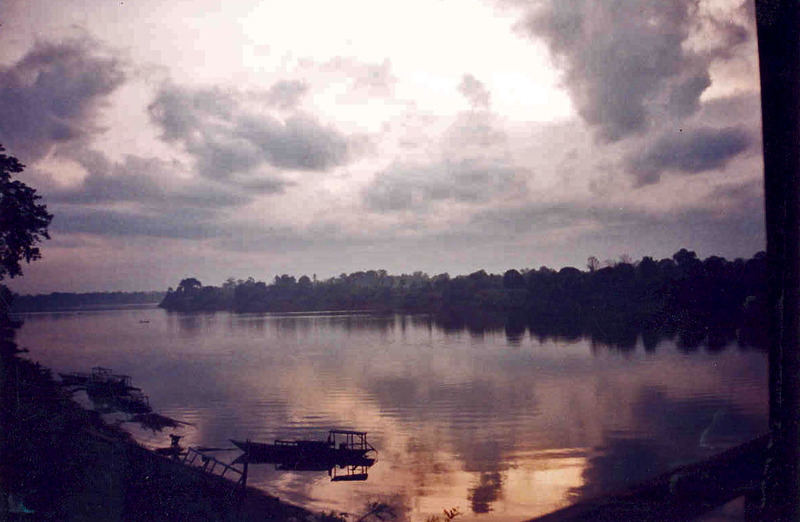 Se San River (Tonle San) Winding through the forests of Northern Ratanakiri Province, the Se San River represents a final boundary between civilization and jungle as little besides thick foliage, wildlife and scattered tribal villages exist to its North. This scenic and remote river edges on Virachey National Park and its tributaries, including the O'Tabok River, offer access into the park. Check out ourTreks for adventures in this region. Tonle Sap River For most of the year, the Tonle Sap drains the great lake into the Mekong, but in flood season when the Mekong swells, the Tonle Sap actually changes direction, filling the great lake. There are boat races on the Tonle Sap at Phnom Penh in November around the time that the river switches directions. Tonle Sap Lake One of the largest sources of freshwater fish in the world, the Tonle Sap Lake swells in the wet season as the Mekong floods it. Cambodia's great lake provides a source of livelihood for thousands of fishermen and fishing communities along the lake, including those of numerous floating and stilt villages on and around the lakes. Boat trips on the lake connect Siem Ream to Phnom Penh and provide an interesting cultural experience.